I am wading through a backlog of pictures that need there five minutes of fame .. or so they are telling me .. I am stuck in neutral ... behaving more like a cat than a gardener right now. All I want to do is nap ... but in those rare moments when I am in the garden I am smiling. I had planted "a" day lily amongst the helter skelter of plants in the ally way .. not thinking of what is this day lily ?? I have no idea ... but stick it in the garden and let it do it's own thing .. I might just figure it out when it blooms .. that happens more and more these gardening years .. argh !! Of course I fell in love with it and thought I should have dozens of these beauties .. that is the slippery slope I fall on when the love affair happens with a plant smiling away at me. I have to rein in that lust and behave myself .. but really .. it is a beauty ! Next the gaggle of geese that line the ally way .. they are in my mind anyways .. too cute to believe! I have a secret fear of chickens and geese so this is as close as I will come to them. Gardening does seem to be a type of therapy for nonsensical, silly fears at times .. I mean really, what is so scary about chickens and geese ? .. go figure ! All time favorite golden rod aka solidago is "Crown of Rays"
It is so well behaved I can't believe it .. it is generous with it's flowering because you can cut the finished blooms off and it will behave like the ever ready bunny with more. Another reliable beauty is this hydrangea "Summer Lace" .. I love "lace caps" and this blushing girl is one to have if you are a fan of that form. It helps hide the AC unit and turns a stunning deep pink as the blooms age .. why can't I age that way?!! .. well .. not deep pink , but I would have taken the stunning any day !! The front garden is holding it's own so far .. although I have deep guilt over my Bloodgood Japanese maple getting a bit crispy ... watering can be a huge job I run away from, but Garden PA is wonderful about offering .. phew ... a load of brownie points for him !! The front garden is rather chaotic .. no real plan .. I just plunked plants that I liked and there they live. Alright .. enough of me droning on about the garden .. now for something very special. I was given a wonderful handmade gift that was totally unexpected .. aren't those the best kind ? A gorgeous quilt in a pattern called "Toss the Bouquet" .. The card enclosed reminded me that I would be wrapped in a bouquet of flowers during the hard cold winter that always seems to last forever each year. That was such a comforting thought .. the flowers .. fighting off old man winter ! Marg you are such a generous talented friend and I so appreciate having this beautiful gift from your hands ... thank you again so much ! Joy, nice to see your garden is weathering the mid summer slump with its gorgeousness intact. I had a friends over for a BBQ a couple of weeks ago and felt I had to explain that some things had already bloomed and some were on their way. Thank goodness for annuals! I am in love with that green plant (shrub?) in the last pic to the left of the hosta. What beautiful foliage! Can you tell me what it is? It kind of looks like a barberry. Thankfully I managed to sort out my blog roll and am now receiving up to date posts from you Joy. I am so glad cos I may have missed this beautiful post. Your borders are marvellous, crammed packed with so many beautiful plants. Just how I like them. We seem to share our plant tastes as I have so many of the same plants....even Pinky Winky! Although, I've not found it too much bother. The golden rod is a new one on me, it looks lovely and those bright yellow blooms really draw the eye. I love your quilt, what a super looking quilt to wrap yourself up in to keep cosy in wintertime. I really admire anyone who can put together something so gorgeous. Wishing you a good weekend Joy - from a cold wet Scotland! Love the blooms. Those plants do remind me of geese so funny(-: I love daylilies and mine are all done early...like end of May so its nice to see some blooming now(-: I m done with Summer. It is hot and smokey here from the fires in the area. Yuk. Our Japanese maples are looking pretty sad this year after the harsh cold winter winds . All looks lovely in your gardens , Yes Papa here has been wonderful in helping with the watering as it has been dry with no rain for over a week now . The humidity makes me sleepy and it has been humid here , Thanks for sharing . Have a good weekend ! My goodness that is one beautiful quilt, the work and love that she put into that is amazing. And it will do double duty, one to keep you warm, and the other to lift your spirits in the winter. Joy, that day lily is it a coral toned flower? Love it...and it's so pretty, you will have to split it and try to tuck it into other spots in your garden...that is if you can find a bare spot. Everything is so lovely in your garden, and you had heat? Obviously you are doing it all right, because where are the fried leaves, the lacy leaves, the brown and burnt leaves...lol. I've always admired gooseneck loosestrife, but it's considered invasive here, so I don't dare. It looks like you have it contained there along the walk, and boy are they cute! I still love those blooms. Hello Ms S girl ! First .. YES ! it is a Golden Japanese barberry but I am not certain which exact cultivar it is .. not "pillar" though .. it has more of a rounded shape that I try to keep. Buttons girl you are so sweet, thank you ! and YES ! 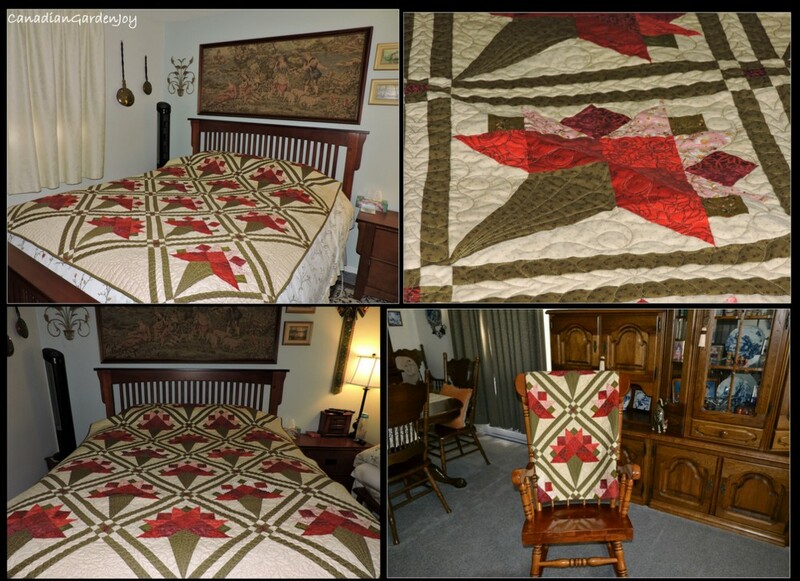 This quilt is amazing .. a true work of art and I am loving it : ) Take care girl ... that haying is tough on your body ! Angie girl ... No wonder people stop and ask you about your beautiful garden ...it is so pretty and even though you have had so much rain those roses are a real wow factor! Pinky Winky and I have had several discussions on it's dropping form .. I can't find just the right support that would look pretty with it .. I will have to make one up myself! hey thank you for keeping me on the blog roll girl .. some times I am so boring I put myself to sleep! haha .. Yes I admire these gals that have such a talent for crafts as quilting .. I am rubbish at those type of talents ;-) Sending warm thoughts for some sun for you Angie ! Cindee girl thank you ! I can well understand that you are sick and tired with that heat and smoke .. time for relief now eh ? They really do look like geese heads and they make me laugh too .. Hope you get some cooler days and rain SOON !! This is my favorite solidago , I would recommend it to anyone looking for one! I am very fortunate to have such a generous friend indeed ! Hey there Jen girl ! I think I have to wait another year before I try and split this lily but I am making notes about it for sure .. yes we have heat but a bit of rain and a bit of watering (well over 4 hours of watering is not a bit) keeps it going so far .. who knows though with the rest of the month breathing fire down our necks ;-( we will join you in the brown and burnt part! Robin girl I love my geese ... and it is contained(so far) in the ally way .. they do make me smile with that shape and look ... I expect to get pecked one day going down the path! Hello sweetie and I am so sorry about the back .. knees up and resting with a pillow tucked under them .. heating pad even though it is so hot out .. helps loosen the muscles up! I used to have a better behaved PW bu this year it is sloppy and all over the place .. but like you say the flowers are gorgeous ! Quikfire seems to hold a better form though. Yes I am so lucky to have this quilt .. it is a real heirloom for us. Hope it recovers fast ! Take care ! What a beautiful daylily. Your garden looks wonderful--no drought there this year, eh? Hey there HB ... Thank you!.. we are so very lucky not to have severely dry weather, although it has happened but never as bad as yours ! your daylily is very nice, pretty color. I also liked your hydrangea, I'd like to have one for flowering in July because my Grandiflora blooms in mid-August. What a wonderful gift was presented to you, you're so lucky! Hello nadezda girl ... I just left a comment on your garden tour which was wonderful (especially the white garden : ).. If you can get your hands on either Quickfire or Forever & Ever "Summer Lace" those two and some really new cultivars are ones that bloom sooner as in July for you .. Little Lamb is as well, depending on what shape you want from lace cap to paniculata. As usual your photos are stunning. Looking at your pictures, I am always impressed at how good you are at matching colours. Wow, seriously? That quilt is outstanding. What a talented lady Marg is. And generous too. I'm sure it was a labor of love for her. My 'Pinky Winky' is actually doing quite well. I cut it back hard each spring and I think that is what keeps it from flopping. Who knew? I noticed your beautiful Astilbe 'Color Flash' in the front border. I'm so jealous. Mine stays green. I have it in a pot where it gets full-on morning sun but it refuses to color up. Do you have a secret or did I just get scammed by the nursery? I love your surprise daylily. The soft, satiny flowers and the way the petals fold back make it so charming. I can see why you like it too. My daughter was pecked in the face by a rooster so she doesn't take too kindly to chickens and geese can be really mean too. So I understand your anxiety over them. You've got the perfect remedy in your garden! Joy, your garden always looks so pristine, healthy. Love seeing it and hearing from you. This quilt is a gorgeous, generous gift. You are blessed. Alain I just found you here now (my bad !) .. You are too sweet : ) thank you so much ! Gracie I was over whelmed by this quilt .. it is just gorgeous, Marg is so talented it is amazing .. it really is an heirloom for us. Yes ! I cut Pinky way back in the Spring but for some reason this year it has grown so long "arms" it is a bit floppy .. Here is what is funny about Colour Flash .. I have two planted together but the one on the left is not as colorful as the one on the right. I also have the lime green variation with the pink flower heads .. in the shade garden it looks nice. So I have no idea why some work and some don't .. a matter of luck ? LOL.. yes it is awkward to admit you find those silly birds scary ... certainly your daughter has good cause to be leery of them ! I love my type of geese in the garden though .. and that Scottish Fantasy day lily really wowed me .. making note of that ! Lisa girl believe me if you saw parts of my shade garden right now you would be shocked .. it is a mess ... too dry too long ... so when I watered today I had to cut back a lot of dead foliage ..very scary looking ugh ! Yes I am so very lucky to have such a beautiful gift from Marg .. I cherish it !